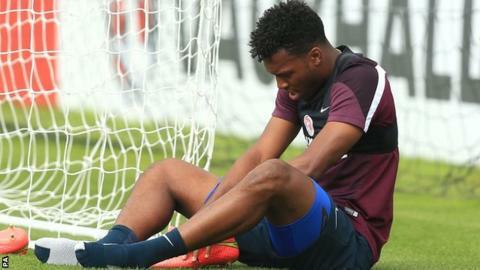 Liverpool striker Daniel Sturridge has returned to full training for the first time since damaging his hamstring while on England duty in August. Brendan Rodgers's side have won only four times in 14 matches without him. Sturridge, who scored 21 goals in 29 league games last season, was nearing a return to action last month before picking up a calf-strain. Reds boss Rodgers expects Sturridge to be available for the next league game, away to Crystal Palace on 23 November. Rodgers criticised England's handling of the 25-year-old after he was originally ruled out for up to three weeks. He has played only three Premier League games this season, scoring in the 2-1 home win over Southampton on 17 August. Liverpool are 11th in the Premier League table, 15 points behind leaders Chelsea, and without a top-flight win in their last three outings. They are also fighting to stay in the Champions League after three straight Group B defeats.